Whether you are ready or not, the first day of school has come! For kindergarteners, those first few weeks can be overwhelming. With some helpful tips, you can make this transition much easier. 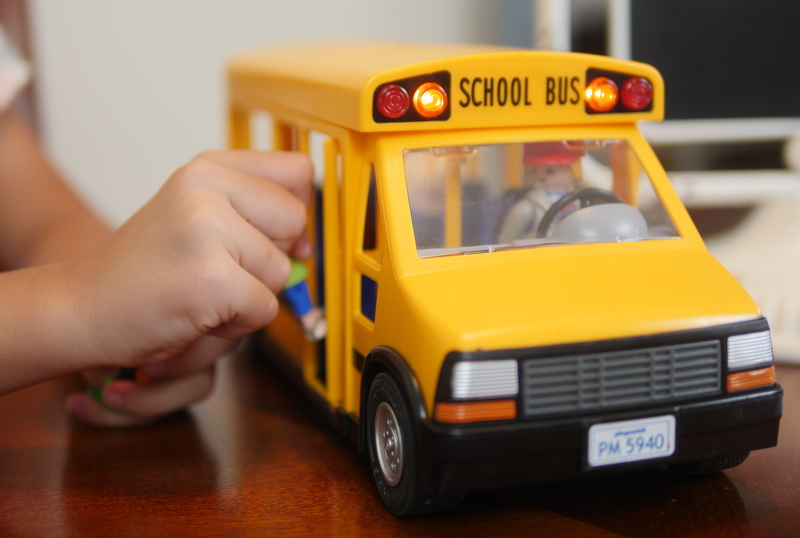 As a fifth year teacher and a parent to a new kindergartener this year, I am sharing my ideas for getting ready for kindergarten with the PLAYMOBIL School Bus. Check out some great PLAYMOBIL toys at Walmart today! Are you interested in buying this product? Hover over the photo above to click through to Walmart to shop! If you are preparing your child for the first day of school, riding the school bus is one of the first things he / she will need to know how to do. Featured today on Theresa’s Reviews, you can check out tips on how to get ready for kindergarten with a focus on being prepared for the first bus ride. Although riding the school bus can be intimidating, you can help your child be more comfortable by recreating the scenario. Use the PLAYMOBIL School Bus to go over what to expect on the bus ride. Available at Walmart, the PLAYMOBIL School Bus comes with four figures, which are three children and a bus driver. Accessories include backpacks for the children and a hat for the bus driver. With front and rear lights that really work, the bus also comes with a stop sign sticker. These safety elements can help you go over bus stop safety with your child. Another neat feature is that you can take the top off the bus. This can help you go over proper seating on the bus. With a clear view of the seats, use the figures that bend, sit, stand, and turn their heads to show how children should act on the bus. If you have older children who have experienced the bus before, ask them to show support. Siblings can use the PLAYMOBIL School Bus to set a good example of how to properly behave. Using the toy figures can show how they will sit near each other, which can make your younger child feel more secure. When you go over procedures, make it a game. From lining up to get on the bus to staying seated when it is driving, discuss each procedure, and then act it out. Doing this together turns the PLAYMOBIL School Bus into a helpful learning tool. You can also make this a fun game by making the figures to the right thing first, and then having them act out what not to do, so your child can see what might go wrong if rules are broken. My daughter thought it was hilarious to have the figures act out the rules being broken. When one of the figures sang loudly, the bus driver got a headache. When the figures had a silly dance party on the bus, the bus driver missed his turn. Acting out what not to do helped show the reasons why rules need to be followed. Pair the School Bus activities with a children’s book about getting ready for kindergarten. One book that talks about riding the bus to school is The Berenstain Bears Get Ready For School by Mike Berenstain. Recreate the different parts of the story using the figures, the school bus, and a doll house. Your figures can go through the actions the characters do in the story, including finding their backpacks and riding the bus, to see what a good morning routine should look like. If your child is going into kindergarten, creating a simulation of the routine they will follow can help them. Playing make believe also allows your children to ask questions about what they should expect. Even after the school year begins, continuing to play make believe with the bus can be helpful. You can see how your child’s routine changes, whether they sit next to different friends, and if they have any new questions. With PLAYMOBIL, you can turn a game of make believe into a helpful and informative learning tool for children. For more parenting tips, follow Theresa’s Reviews on Facebook, Twitter, Instagram, Pinterest and YouTube. If you have a child going into kindergarten, what is your biggest worry? Share in the comments! What a great idea to do some role playing with seinarios! It’s really helpful to do with kids going into a new situation! I absolutely loved PlayMobil when I was a kid & I love buying it for my niece. This is such a cute idea & I had no idea they sell them at WalMart! I did too! When I was a kid, my mom would take me to this one book store that had a huge selection of all the different Playmobil. I agree, it’s neat you can conveniently get them at Walmart now! So cute and fun! We have the Fire station and ambulance and loooove them! Those ones look really fun too! We can’t wait to collect more. I’m sure an older siblings support would make a world of difference! And going over the procedure too! I’m glad you found some helpful tips here! I absolutely love this. My little one is getting ready for school and this just gave me an idea of what I can do with him. Thank you. That’s awesome! I appreciate hearing that you can relate. My youngest is still not ready for school but he’s obsessed with school busses. He’d love this toy! That’s a good start though for when he is ready for school! You might also find a program that lets him get on one to practice a few months before Kindergarten. I bet he’d have fun! I never would have thought to use something like this to act out scenarios with the school bus, but what a great idea. It certainly seems like a good way for kids to get familiar while having fun. Thanks for sharing. I’m glad you found some helpful parenting information here!